This weekend I went to see Moonrise Kingdom (finally!). I loved the romance and the peter pan collars. During the days I spent a lot of time in the yard with Elliot. My outfit matched the picnic table. I painted my nails the color of blueberries while watching crime shows on Netflix. And I totally sprinkled the berries that now matched my nails on this cake. What did you guys do? The truth is that this could be called “Anybody Bait”, but that just doesn’t flow. Believe it. So make this for your boo! Make it for your very best friend. Roll berries across your apartment for your pup. Eat this for breakfast. Eat it in the afternoon with coffee. It’s truly delicious. Preheat your oven to 350°F. 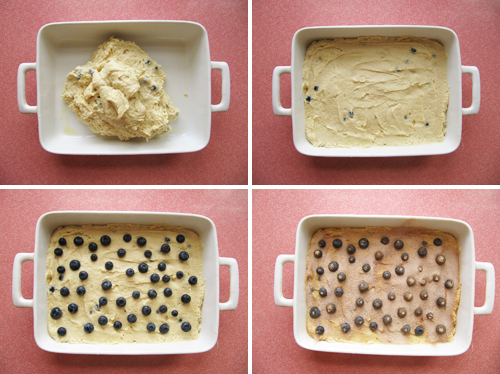 Grease a 9×13-inch baking dish with cooking spray or butter. Whisk 2 cups of flour together with baking powder and salt. Set aside. Using an electric mixer, beat together the butter and sugars on medium high until fluffy, about 2 minutes. Add the eggs one at a time until evenly distributed. Turn the speed down to medium and mix in 1/3 of the flour mixture until incorporated, beat in half of the milk. Beat in half of the remaining flour mixture, remaining milk, and finally remaining flour. Toss berries with remaining teaspoon of flour. Using a rubber spatula, fold berries into the batter. Spread batter in prepared pan. For the topping, scatter blueberries over the batter. Stir cinnamon and sugar together and sprinkle over batter. Bake until a toothpick inserted in the center of cake comes out clean, 45-50 minutes. Cool in pan for 20 minutes, cut into squares and serve. Elliot likes to chase down blueberries. He just love them! I love this cake! The top is my fave. Your weekend sounds amazing, for real. ooooh i have made this cake before! it’s so buttery and summery! this weekend i went to trader joe’s for the first time and smuggled many jars of cookie butter over the border. yay! Hellz yeah! It really is! And congrats on the cookie butter stash! That stuff is trouble, right? I have always wanted to make this. It looks so good! And how cute that your dog likes blueberries?! oh, you totally should make it soon! And yeah! I love his blueberry love. Your weekend sounds like the absolute perfect way to enjoy the last few weeks of summer! I can’t wait to make this cake soon. I might add a lemon glaze to further bring out the tartness of the blueberries. A lemon glaze would be just perfect on this! I like the way you think, Sara. Oh wow- that looks amazing. Ah-May-Zing. In reality I will make this for me, myself, and I! Yeah man! It’s just perfect for anybody, really! I like it for breakfast. 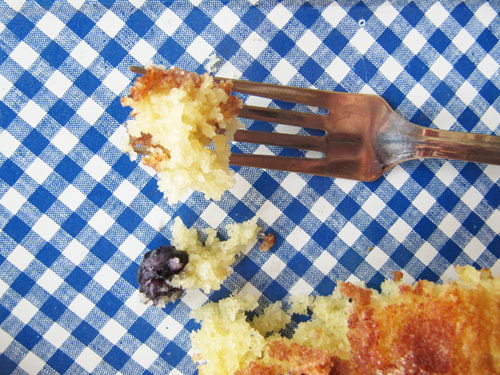 Gingham + blueberries + cake is a dreamy combo! I was so close to watching Moonrise Kingdom in July and I still haven’t. Boo! Must change that. Oh, you should go see it soon. It was just as dreamy as I imagined! It looks like a donut cake. Yes! Totally tastes like a donut cake. Awww, Elliot is so cute! I love Cook’s Country and had printed this out a while ago; finally made it yesterday. Your photos are making me want another piece…too bad it’s gone! A blogger mentioned that it tastes best the first day, so I divided it by four and baked it in a 6-inch round pan for my husband and I. My husband loved it, as promised 🙂 Personally, I’d just had dental work done and with my numb tongue, I couldn’t taste it as well, but it was good enough to want to make again! I agree, it’s really “anyone bait,” but that doesn’t sound as good. 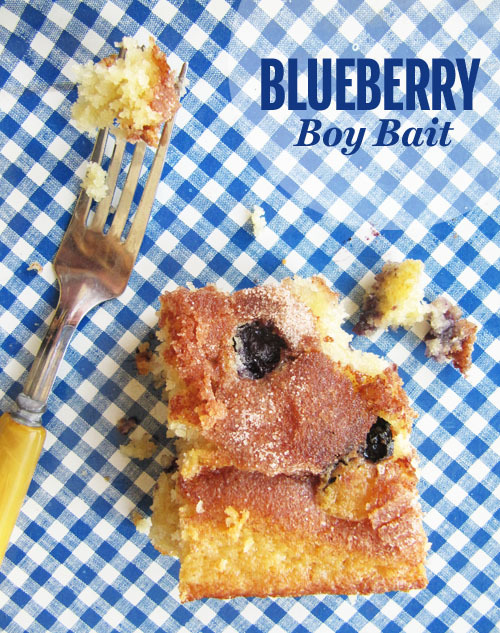 “Bait cake” kind of sounds like it would taste like fish – lol.